For the last decade or so, I’ve been participating in international braid swaps but on the occasion of the 70th anniversary of my local handweavers and spinners guild, I organised a braid swap among members of my own guild here in Sydney, Australia. Happily, there were nine other participants and having made six samples, we got five back with one being retained by the Guild for archive purposes. The braids were done in a range of materials and a range of braiding traditions including ply-splitting, lucet, Sami band weaving (done on a Gilmore Mini Wave loom), Lithuanian band weaving (done on inkle loom), Amerindian finger weaving (adapted to Japanese marudai) with some kumihimo on marudai and takadai, traditional and contemporary. I’m inspired to have a go at copying all of them! My kainokuchi was inspired by a mimi-ito on a set of 18th century samurai armour held in the collection of the Powerhouse Museum, Sydney. I used 2/20 tencel, four strands per bobbin. I made the sample extra long so I could cut off small pieces for colleagues at the Powerhouse who regularly demonstrate lace making with me there at the museum’s Lace Study Centre. My three-three twill needed no tou or sword to tension the threads while working. I was constantly checking my work as I went because the last time I did kainokuchi I got one stitch out of sequence early on meaning the “shell-fish mouth” was out of order through most of the braid. My reference for kainokuchi was Makiko Tada’s first book of takadai braids. Sometime I want to reproduce the Powerhouse armour braid more closely, with its five stitches instead of my twelve, in white, brown and pale green. I’ve explored some possibilities of a design by Nana Akua, experimenting with ball size, colour palette and thread size along the way. From left: 28cm circumference, pearl cotton 8 in white and orange and a tan ball; 26.5cm circumference, pearl cotton 8 in white and pale green on a bright yellow ball; 34cm circumference, pearl cotton 5 in purple and white on a burgundy ball and a 41.5cm circumference, pearl cotton 8 in orange and white on a red ball. The most obvious feature to note is tonality and the need to get sufficient contrast between the background colour and the white thread. The yellow ball fails in this regard, but in the others the white stands out sufficiently. What I found interesting is the need in the red multi-centre ball to use very bright orange and very bright red threads, far stronger colour than I thought necessary. Optically, the orange and red in the border mix to form a general mid-tone orange, which fits the bill tonally. To make my point about tonality, look what happens when I take the colour out. The contrast between light, mid-tone and dark tones works well with the multicenter; the others are more distinctly dark and light with no contrasting mid-tones. Of course, if I was submitting any ball for JTA certification, I’d want to stitch it and take a desaturated, black-and-white photo first to check tonality was the best it could be! One not so obvious feature is the sequence of stitching. After experimenting with stitching the coloured borders first, I found it easier to stitch all the white thread flax-leaf first. That involved stitching the flax-leaf motifs within each boundary, then joining the motifs via a series of triangles and diamonds. Most often, the stitching of the triangles and diamonds sorts out any geometrical issues with the motifs, but (as you can see the photo of my multi-center) care needs to be taken with the hexagons (!). The next fun part of this journey with this Nana Akua design is an online stitchalong with TemariChallenge. I look forward to seeing what my colleagues come up with! Stitch three balls: the first to revise/consolidate the stitching, the second to think about the number of layers/rows and colours and the third to give away. The number of layers/rows for each colour is significant: a single row of colour can too often be “lost” in its surroundings, two rows makes a solid statement and three becomes a “band” of colour. The combination of colours is significant. I urge my students to work with ungen or shaded colour from light to dark in the Japanese tradition. Often the final layer can be significant, as shown in the example I provided: one hemisphere has a final row of dark blue (which seems to “lock in” the petals and reinforces the strong contrast between ‘warm’ and ‘cool’ colours) and the other hemisphere has a final row of orange which moves the colour palette more to ‘warm’ colours. The overall size of the ball can be significant (because the bigger the ball, the more the layers/rows), so I gave her two divided blank balls to consider, one at 27cm and the other at 30cm circumference. I like to keep the obi a green colour, in reference to the vegetation surrounding the flowers. I’m pleased to report the ball my student stitched was exquisitely done! 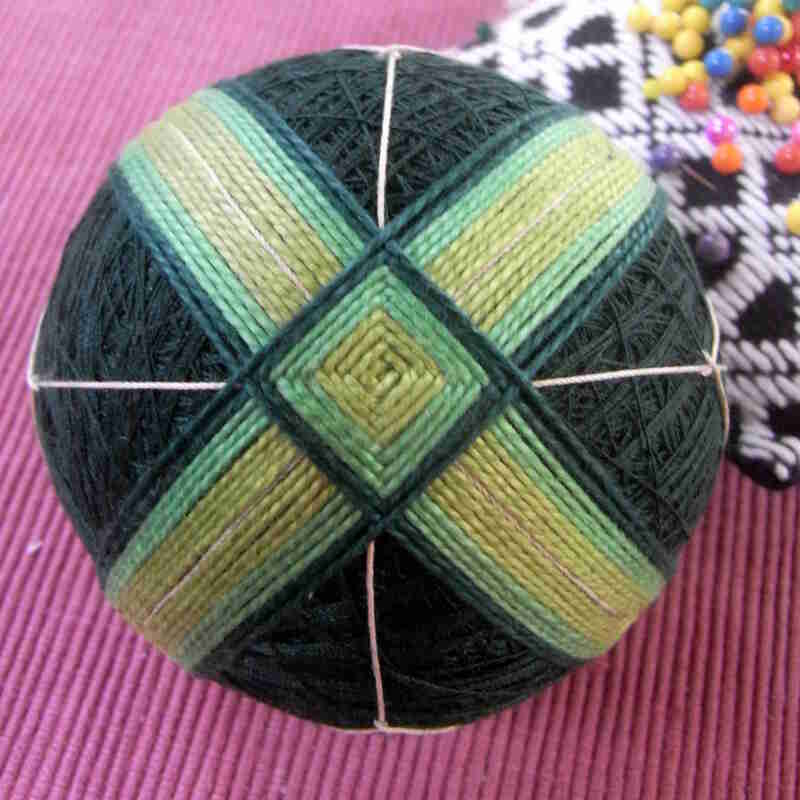 I’ve spent the last year or so teaching temari ball stitching to beginners but have recently taken time out to think about new challenges and opportunities. New directions have developed out of having had the pleasure of meeting other temari stitches in my local area. 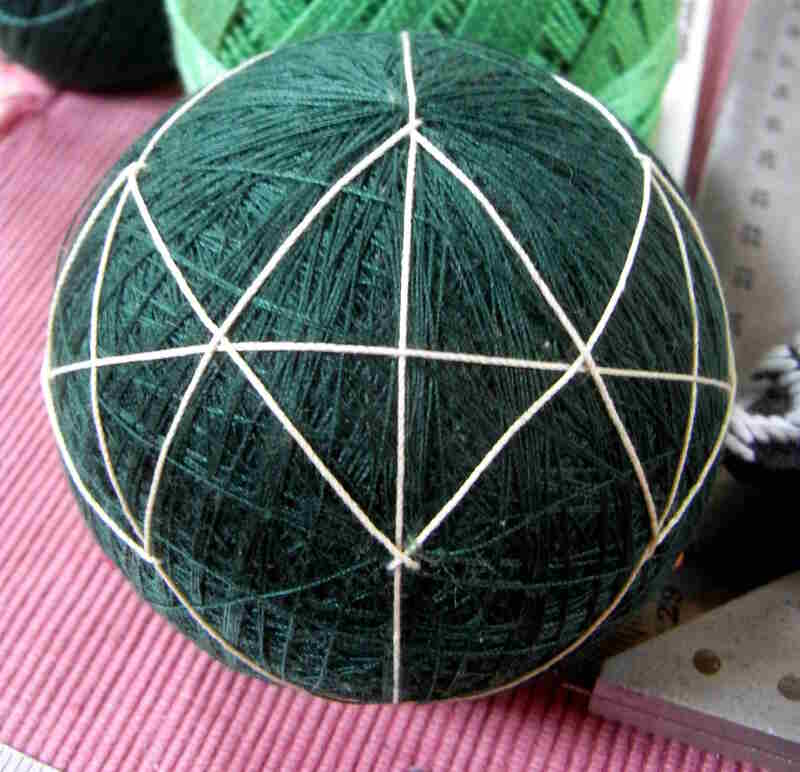 I’d never have imagined it, but local lace makers are very proficient and experienced in stitching temari – a new source of inspiration, far more motivating than interacting with a virtual community of stitchers online with its intrinsic distance and indifference! 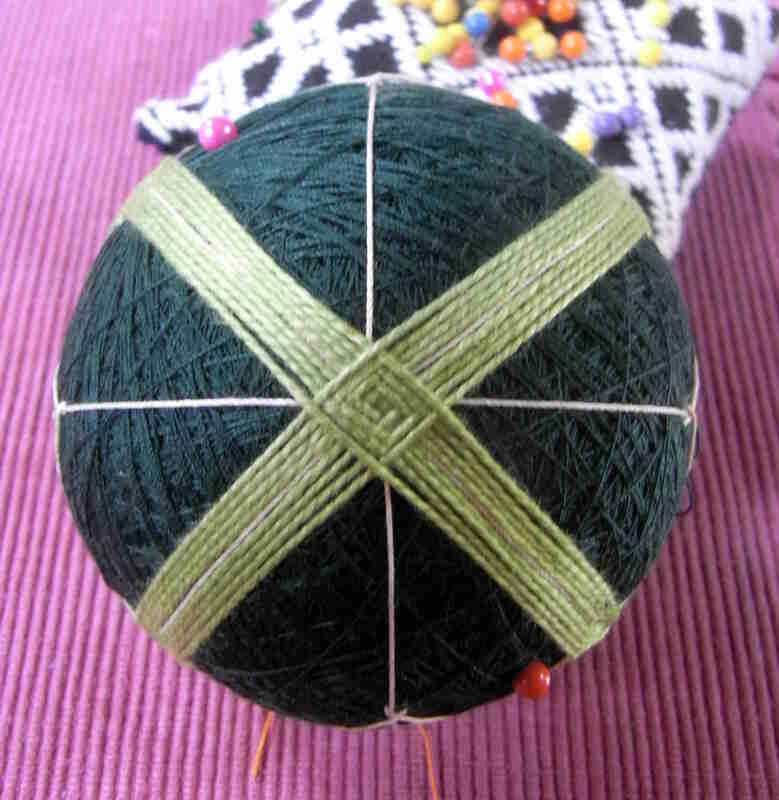 When I first started stitching Intermediate Level temari, I adopted the same approach I’d been using with Beginner temari: look at the pattern, visualise where threads are stitched and then jump in. This approach didn’t work and proved to be very dispiriting. Since then, I’ve realised there are two options available. The first involves computer technology and specifically software which allows the stitcher to plot stitches on a blank virtual ball. The process is slow, but the chief advantage is that you allow a machine to do the imagining instead of the mind. I’ve hit upon a second option, which involves the “trial” stitching of an entire ball. The chief advantage is that a “rough” attempt at an intermediate ball can be knocked out in a relatively short period of time – one to three days working part-time. The downside is that it looks rough, is less than perfect and, unless it’s to be used later for teaching purposes, needs to be thrown away or stitched over. Yes, there is ‘wasted’ thread involved. But one can test colours more thoroughly and certainly assess spacing and numbers of threads required with much greater accuracy. My source for my first two experiments has been Yukio Hisayama and Hiroko Takimoto’s book, Kii temari (Macaw, 1993, ISBN 4-8377-0933-3). I followed the recommended size of 36cm circumference, but after that I was on my own. The pattern inside the small squares is standard over-under interlocking, but certainly the stitching inside the hexagons is not standard over-under interlocking and, as shown by posts to the Temari Challenge Groups.io website, the hexagon interlocking requires more appreciation and understanding than I’m capable of. What I did do, however, was use a standard over-under interlocking in both squares and hexagons. Standard interlocking inside the hexagons is used by the book’s authors in ball #4 on the same page 5, so the experience on my part wasn’t entirely wasted. I abandoned the ball late in the piece mainly because the division lines were less than 1/32″ in accuracy. And frankly, if your division lines are 1/32″ out, one is are wasting one’s time stitching any “all-over” design and expecting perfection. The good news is that I feel very confident about tackling ball #4 on page 5 of Kii temari! Again, I followed the recommended size of 30cm circumference, but was left to my own devices after that. I had stitched a similar ball years ago. I stuck with the same dark green mari, full thickness of DMC gold metallic thread for the C8 divisions, a pure optic white and a slightly darker red than Chinese Red. I have doubts about the 1/2 marking required for the initial red stitches because the authors stitch 6 strips of 4 rows each and I only managed three – either that, or the thread is pearl cotton 8 not 5.
the tone of green going around the outside of each square is wrong (and obviously needs to be wider – probably eight rows wide). I just may have solved the problem of my tackling Intermediate Level balls. It’s just a pity it’s taken me six or seven years to come this conclusion! I took a 17cm-circumference styrofoam ball and prepared a mari 24cm-circumference with Simple 8 (S8) divisions on a dark green background. I stitched the “basket” first in one hemisphere of the ball. 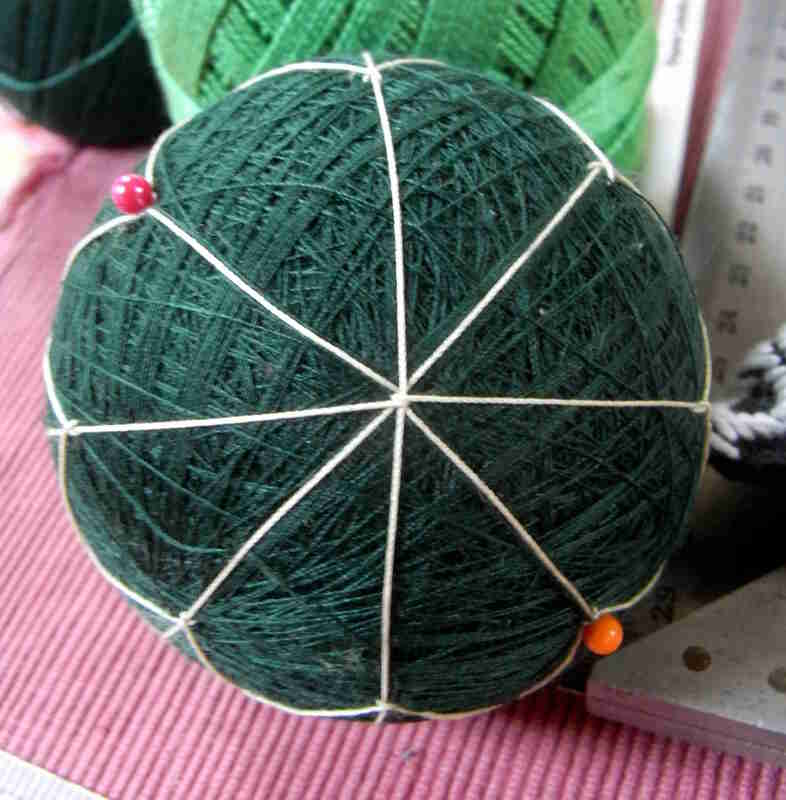 It will be made up of nine rows of stitches in three shades of green. I will add the “flower” in the other hemisphere of the ball later on. Photo 1. This shows the equator. Adding pins 1/3 up from the equator on all eight division lines, I added extra division lines between all the pins. If you like, you can alter the distance of the pins from the equator as follows: 1cm = four rows of stitching. Photo 2. This is a shot of the “basket” hemisphere head-on. The orange pin is my starting point for my stitching; I move to the red pin, keeping at all times to the left of the division line. I continue the stitch around the ball till I end up at the orange pin where I started. Half the round is one side of the division line; the other half of the round is on the other side of the division line. Photo 3. This shows the ‘basket’ hemisphere after stitching four rows. Photo 4. This shows the ‘basket’ hemisphere after stitching nine rows. My next step is to do the same stitching on the remaining four divisions, interleaving each stitch at the equator, so the points at the top of the basket will be overlapping.